The Sony Xperia Z2 Tablet is easily one of the best Android tablets in the market today. However it faces it biggest competition in the form of the Apple iPad Air. 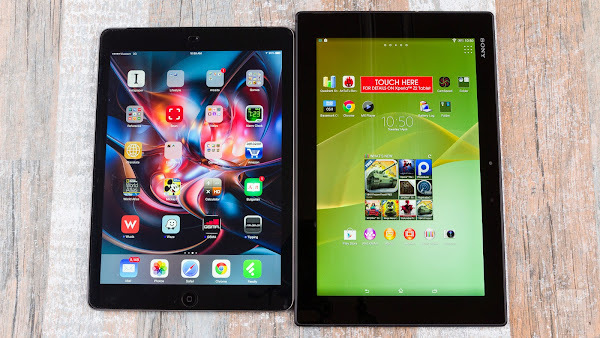 Both the Sony Xperia Z2 Tablet and the iPad Air have a lot of bang to offer great value for money, but lets find out which of the two slates is the better one. The Sony Xperia Z2 Tablet is a lightweight, ultra-thin device with high quality speakers, and a microSD expansion for those who need more space. Meanwhile the beautifully crafted iPad Air is hard to look past, with is excellent selection of tablet optimized apps and superior battery life. Even though the Xperia Z2 may read as the top device if you compare the hardware specifications, the experience and the unbeatable responsiveness of the iPad Air suddenly makes the written specs meaningless. At the end of the day, you will be getting a great tablet for the price you spend on either device. The Android vs. iOS experience will play a big part in your choice here along with specific features like storage expansion and customization.